I'm taking a little staycation this week and although I'll be checking in from time to time I probably won't be blogging much. In the meantime please enjoy this clip from what may be the greatest theatrical performance ever captured on video. It was savaged by the critics but Memphis, the musical by Joe DiPietro and Bon Jovi's David Bryan found its audience and now there's a national tour in the works. First stop: Memphis' Orpheum. Playhouse on the Square's staging of Frost/Nixon, an epic tragedy disguised as a documentary, is deceptively minimal and powerful but what's most astonishing is how none of the players in the ensemble vanish in the long shadows cast by Michael Ingersoll's finely nuanced take on talk show host David Frost or Bill Andrews' complex, career-defining performance as Richard Nixon. Classically trained performers showing off their perfect diction is no substitute for finely nuanced characters and fully developed relationships, and while many fine things can be said about TSC's elegant, artfully imagined all-female production of Shakespeare's most timely tragedy, it's set in a foreign universe possessing no trace of the y chromosome, and a useful dialogue between past and present never fully materializes. In spite of what you may have heard Jonathan Christian's mascara-loving Zaza is only the second best thing about Theatre Memphis' tender, ambitiously mounted musical which makes San Tropez's diverse community the understated star of a show that, on it's painted face, would seem to be all about glitter, feathers, and over-the-top fabulousness. This is shaping up to be a busy weekend. This afternoon I have every intention of catching at least part of the Green Shakespeare Symposium at Rhodes College, then it's off to see pick the twins up from school. Against my best judgment and general policy we will dine in the car on something purchased from a drive-through-window as I drive them out to hang with their mom, the technical director for Hutchison's Weiner Theatre, which is opening a musical revue featuring a mix of contemporary Broadway show tunes alongside pieces by Memphis acts like Lord T & Eloise and Muck Sticky. Yes, we're a very theatrical family. But I won't be sticking around for that one though because I've got a hot ticket for the opening night of La Cage aux Folles. 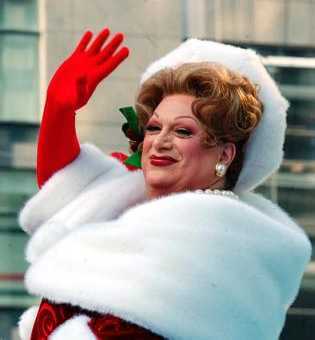 I'll never forget the first time I saw Harvey Fierstein's musical adaptation of La Cage. Well, actually I have forgotten it. Or much of it. Or rather, it all seems like a phantasmagoric blur of song and sequins. It was the 1987 Broadway tour and I had a fever of 103. Threw up on my date right after curtain call. True story. And I have to confess that the experience created a kind of Freudian aversion to the material, which can be completely delightful. Today I'm feeling fit as a fiddle and hoping that tonight's performance—directed by Mitzi Hamilton— will undo what was done all those years ago. La Cage functions as a frothy farce, a tender love story, and a political statement all rolled into one. 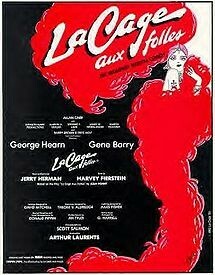 It tells the story od Georges, the manager and emcee of a nightclub featuring extravagant drag shows and partner Albin, a popular entertainer who performs as the great Zaza. The serious silliness gets underway when Jean-Michel, Georges' son from a brief, ill-advised fling, plans a party to introduce his father and mother-figure to his fiancée's conservative parents. 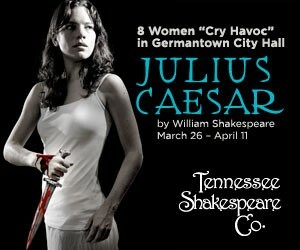 On Saturday, after taking in some afternoon events connected to the Sivads of March festival I'm off to Germantown City Hall for the Tennessee Shakespeare Company's 8-woman production of Shakespeare's Julius Caesar. That's all I'm going to say about that for the moment. On Sunday afternoon I'll be taking in Frost/Nixon which I was unable to see when it opened at Playhouse on the Square last week, but which I previewed here. 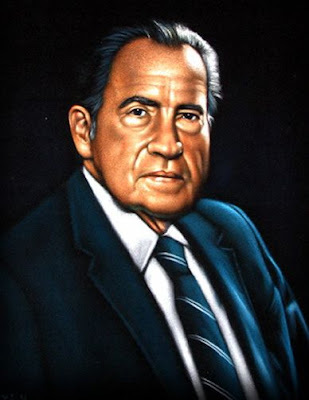 The show has great buzz and as a political junkie who once bid way too much on a black velvet painting of Nixon on ebay (which I didn't win, damnit) I'm genuinely excited. Hope to see you in the theater. 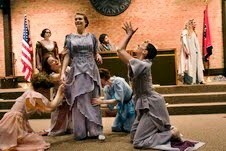 Hey Shakespeare fans the Green Shakespeare Symposium is at Rhodes College today from 2-5 p.m. Here's what Flyer writer Leonard Gill has to say about it. Tony Award Winner for Best Revival of a Musical. Annie Oakley is the best shot around, and she manages to support her little brother and sisters by selling the game she hunts. When she's discovered by Col. Buffalo Bill, he persuades this novel sharpshooter to join his Wild West Show. It only takes one glance for her to fall head over heels for dashing shooting ace Frank Butler, who headlines the show. She soon eclipses Butler as the main attraction which, while good for business, is bad for romance. The rousing, sure-fire finale hits the mark every time in a testament to the power of female ingenuity. 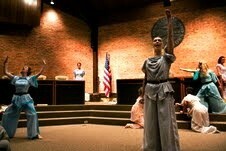 McCleary decided to create an all female production of Julius Caesar since the show was first announced. I suppose I could have asked right away and at some point in the next week I will. But I enjoy a good mystery and this has been something to marvel at. On it's face this Caesar is an interesting answer to the Elizabethan stage where all the roles were played by men. But that would be all novelty, and this is a substantial piece of work. There must be other, deeper reasons. My interest doubled when a striking ad started running on The Flyer's website. It's eye-catching and exploitive in the best and worst senses of the word. the power struggles waged between teenage girls. The struggle that drives JC's plot is reflected in the Heathers (1989) a dark comedy full of murder and mayhem. But the plays politics may be more closely related to the brutal (if bloodless) Mean Girls(2004), and the sunnier but still fierce Bring it On. Or maybe we'll see the recent past reflected a la Hillary Clinton vs Sarah Palin. Set at Germantown City Hall McCleary's JC obviously takes place in an adult world and in some poetic space that is at once classical and contemporary. So it's not taking its cues from any of the films or circumstances I've mentioned. Having revisited the script however, all I can say is that I'm intrigued by all the possibilities for using Shakespeare's words to explore the violent and political aspects of femininity. And vice versa. I hope readers will feel free to share their impressions of and their reactions to this unique take on one of Shakespeare's best known tragedies. Playhouse on the Square's 2020-11 season is an interesting blend of regional debuts and revivals. I'll write more about the shows later but for now this is what the season looks like. Memphis-born actor Jordan Nichols almost died this year. In January the 24-year-old triple threat performer and son of Playhouse on the Square founder Jackie Nichols returned from New York to appear in Pippin and help his father open POTS new performing arts facility. That's when tragedy struck. Or almost struck. Jordan was chatting it up with friends at The Blue Monkey after a rehearsal when he fell down. His heart had stopped and if not for the quick action of a CPR-trained bartender he wouldn't be with us today. Those who have missed the sound of Jordan's singing during his recovery are in for a treat. 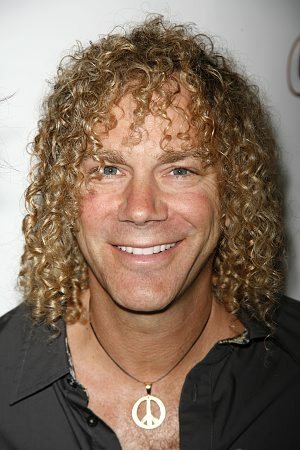 He will be joined by Carla McDonald, Lili Thomas, and David Foster in a concert benefiting Sudden Arrhythmia Death Syndrome. Call 901-270-5372 or email SADSbenefit@gmaill.com to make your reservation. Donations will be accepted at the door when you pick up your ticket. Buffalo Gal & Over the Taven close this weekend. 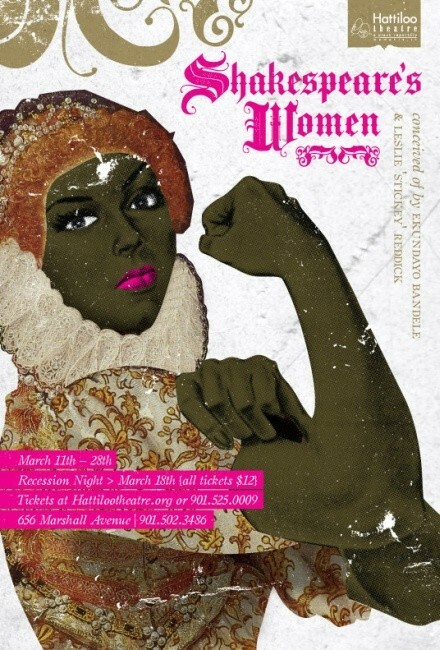 Shakespeare's Women, an original compiled script assembled by Memphis artist Leslie "Sticky" Reddoch opens at The Hattiloo. But this weekend is shaping up to be all about original material, new ideas, and freaks. Wild Legacy is Memphis director and playwright Gloria Baxter's theatrical homage to Olaus and Mardy Murie, the celebrated husband and wife naturalists who aided in the establishment of the Arctic National Wildlife Refuge. This commissioned piece created by Voices of the South is being prepared for touring. I'm having coffee with Gloria Saturday morning and will have more about Wild Legacy soon. Susan Ellis wrote a nice preview of Theatre Lite's latest offering 2 Across. I've got to admit, I'm not into puzzle books or romantic comedies so a "comedy about crosswords and romance" isn't all that appealing. On the other hand this young group is all about getting back to basics: "to awaken the imagination and ignite the senses with the first word spoken... Without scenery, sets and full-out costumes." And they perform at the Beignet Cafe where they make the beignet pyramid, which is a pyramid of beignets drizzled with chocolate sauce, topped with cherry pie filling, powdered sugar and whipped cream. So there's that. Lastly, if you've always wanted to check out the FreakEngine but didn't want to have to stay up until midnight to do it now's your chance. For the first time ever FreakEngine, a popular, long-running, ever-evolving variety show that features improv comedy, performance art, dance, music, and yes, "torturous human experiments" will be performed in prime time. $10 at the Evergreen Theatre. UPDATE: Wild Legacy, which is mentioned above and listed in the calendar has been postponed. Darius Wallace's solo show Hold Fast continues at TheatreWorks through this weekend. Wild Legacy, a commissioned piece celebrating the creation of the Arctic National WIldlife Refuge, is part of a much bigger national celebration of ANWR that has been moved from spring to fall. Somehow the schedule change fell through the cracks. I only discovered this morning when I sat down to talk with the show's creator, Gloria Baxter. Very sorry for any confusion. Ching announced to his staff on Friday, March 5 that he will move to Ames, Iowa with his family sometime in May 2010. The relocation is a result of a new position attained by Ching’s wife, Barbara. Barbara Ching, a current member of the English Department at the University of Memphis, has been named chair of the College of Liberal Arts and Sciences’ English Department at Iowa State University. Michael Ching looks forward to taking time off from the administrative side of opera to compose and spend more time with family. Michael has been the Artistic Director of Opera Memphis since 1992, often acting as Executive/General Director. He brought an innovative, collaborative spirit to the job. Under Ching Opera Memphis began experimenting with non-representational sets and costumes. In recent seasons he's developed a partnership Midtown's classically eclectic New Ballet Ensemble. His tenure also witnessed the construction of the Clark Opera Memphis Center in East Memphis. "I have been privileged to work with a great group of supporters and staff who have all striven to make Memphis a better place," Ching says. "I have enjoyed working at a company that places opera in the context of the Blues and the birthplace of Rock and Roll. That work, of providing opera with a distinctly American cultural context, is not done, and I hope that Opera Memphis will continue to provide a unique voice for this unique community. Send me some barbecue in Iowa!" A production of Ching's own a cappella version of Shakespeare's A Midsummer Night's Dream had been planned for Next year's opera season. There's some footage of Ching conducting a rehearsal at the end of this clip. Remember when musicals were made into movies and not the other way around? These days it's getting harder and harder to tell The Orpheum's Broadway series from its film series. Six of this years eight touring musicals started out on the silver screen. Seven if you cheat a bit and credit The Wizard of Oz as source material for Wicked. Love it or loathe it there can be no doubt Wicked, an effects-laden musical about the witches of Oz, brings the green to Main & Beale. It certainly cast a spell on Memphis theatergoers last season who turned out to see the show in big numbers. The Orpheum's aggressive pre-sale strategy also worked like magic, making tickets disappear at an astonishing rate.